John F. Herring Snr was born in London, the son of an American-born merchant with Dutch heritage. 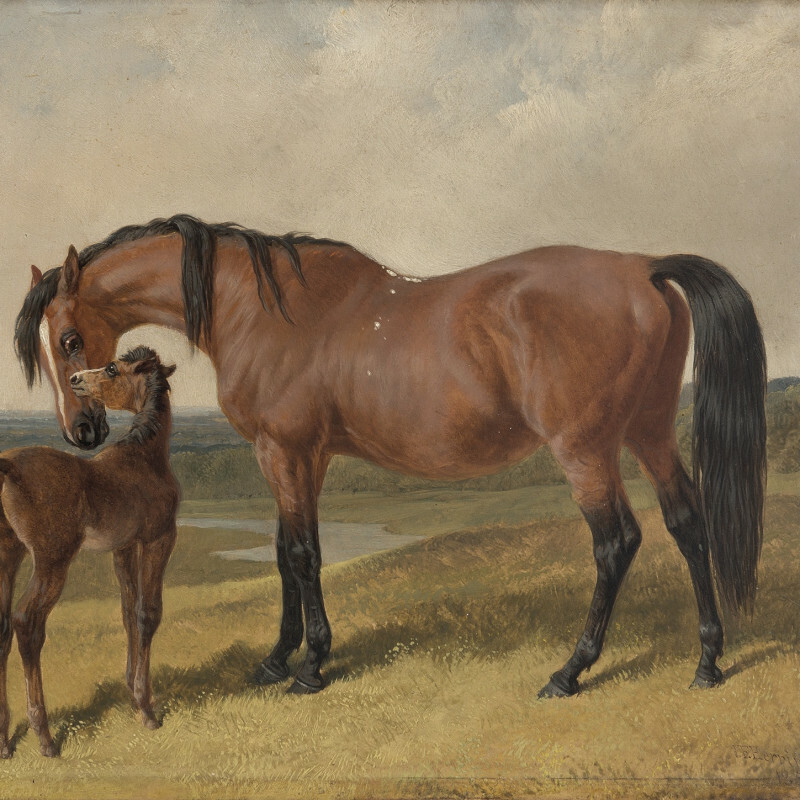 He loved drawing and horses from an early age, and in 1814, at the age of eighteen, he moved to Doncaster, where he began work as a night coachman and painter of inn signs and coach insignia. By 1815, he had married Ann Harris. As a young man, Herring spent his spare time painting portraits of horses to decorate inn walls, becoming known as the ‘artist coachman’. His talent gradually drew attention from wealthy customers, leading to commissions to paint hunters and racehorses for the gentry. In 1830, Herring left Doncaster for Newmarket, where he spent three years and might have received tuition from Abraham Cooper. He then moved to London, where he received financial assistance from W. T. Copeland, an important businessman and patron of the arts. During this period Herring lived in a house on Copeland’s Essex estate and produced a collection of hunting paintings that were later used as designs for Copeland Spode bone china. From 1840, Herring found success with a range of royal patrons, including the Duc d’Orleans (son of King Louis-Phillipe), HRH the Duchess of Kent and Queen Victoria, who remained a loyal patron for the rest of Herring’s life. During this period Herring's work reached a mass audience via engravings. Popular paintings that were distributed in reproduction include Herring's portraits of the thirty-three winners of the St Leger and twenty-one winners of the Derby. Another was the iconic Pharoah's Chariot Horses (1848): the model for all three heads in the painting was his own Arabian stallion Imaum, previously owned by Queen Victoria. Herring had the horse specially trained and he appears in many of Herring's later paintings. In 1853, Herring moved to Meopham Park near Tonbridge, and broadened his subject matter to include agricultural scenes and narrative pictures, as well as sporting works of hunting, racing and shooting. Herring exhibited at the Royal Academy from 1818 to 1865, at the British Institution from 1830 to 1865 and at the Society of British Artists from 1836 to 1852, where he became vice-president in 1842. By 1836, the growing fame of Herring's teenage son, John Frederick Herring Jnr, led him to begin adding the suffix ‘SR’ to his signature. All three of Herring's sons, John Frederick Jnr, Charles and Benjamin, became artists, while his two daughters, Ann and Emma, both married artists (the former married Harrison Weir).